SideFX has posted a sneak peek of PolyDraw, a new direct modelling feature coming up in Houdini 17, the next major update to its procedural 3D animation and effects software. The video was recorded during the firm’s Houdini Hive user event at Siggraph 2018. SideFX has been working on updating Houdini’s modelling tools for several releases now, but this looks like a concerted effort to create something more familiar to users of other DCC applications. 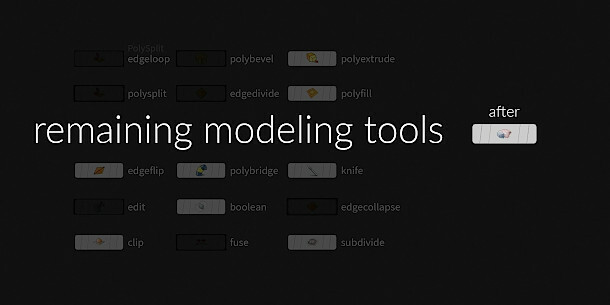 PolyDraw overcomes two main shortcomings of Houdini’s existing modelling toolset: that it creates a lot of unnecessary construction history, and that there’s no way of creating geometry from scratch – as opposed to editing models created in other software – short of starting with primitives or NURBS curves. An evolution of the TopoBuild node introduced in Houdini 15, but geared towards direct modelling rather than retopologising geometry, PolyDraw is designed to replace the functionality of around 15 other nodes. At 13:00, you can see it in use for edge modelling, working from a reference image. The workflow looks similar to that of the Quad Draw tool in Maya, creating new polygons by plotting out points. PolyDraw can also be used to clean up the geometry generated by Houdini’s existing Boolean system – a much better fit for the software’s standard non-destructive workflow – in particular, to remove n-gons. You can see Boolean modelling workflow from 20:30 in the video, and PolyDraw in action to clean up the resulting geometry from 32:30 onwwards. SideFX hasn’t announced any of the other features or a release date for Houdini 17 yet, but given that PolyDraw doesn’t even have it’s own icon in the demo above, we imagine it’s still some way off. The current release, Houdini 16.5, is available for Windows 7+, Mac OS X 10.10.2+, and key Linux distros. The full Houdini FX edition costs $4,495 for a node-locked licence; $6,995 for a floating licence. Houdini Core, which lacks simulation tools, costs $1,995 for a node-locked licence; $2,995 for a floating licence.